A four-day mega ICT event 'Digital World-2017' is set to kick off Wednesday at Bangabandhu International Conference Centre (BICC) to showcase technology-based innovations and achievements aiming to unlock economic potential of IT sector. Prime Minister Sheikh Hasina is expected to inaugurate the Digital World at a function to be held at BICC Wednesday. 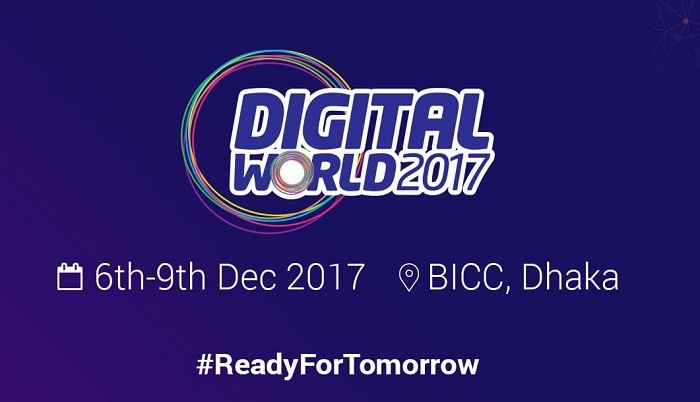 The ICT Division and the BASIS in association with several IT organizations are organizing the digital world-2017 with the theme of "Ready for Tomorrow". This year's theme signifies the readiness that Bangladesh has achieved over the past 9 years in ICT sector. President Abdul Hamid and Prime Minister Sheikh Hasina issued separate messages on the eve of the event. The President in his message said, "The present government under the leadership of Hon'ble Prime Minister Sheikh Hasina has undertaken massive development programmes aimed at implementing Vision-2021 and to turn our country into 'Digital Bangladesh'." "To achieve the target, ICT Division has taken some mega initiatives including establishment of Hi-tech Parks and Software Technology Parks at Divisional and District levels," he said. The Prime Minister in her message said, "I am happy to know that ICT Division is holding 'Digital World 2017', a mega expo in ICT sector, to celebrate Digital Bangladesh. On this occasion, I congratulate the countrymen for accepting the digital technologies with enthusiasm to help fulfill the dream of Digital Bangladesh." "We started materializing Digital Bangladesh in 2009 using digital technology as the key driving element. The people have welcomed the philosophy and the nation soon experienced all sorts of positive changes, especially in connectivity, service delivery, banking, communications, education, healthcare and many other socio-economic areas. These efforts have strengthened our global position in ICT sector," said the premier. In alignment with Vision 2021, both public and private sectors are continuing their efforts to leverage ICTs for creating opportunities and solutions for our society. I admire the efforts and engagement of ICT Division with its stakeholders to this effect, she said. I hope that these efforts will help us attain our goals of generating two million jobs in ICT sector, achieving USD 5 billion exports from this sector and developing a knowledge-based society by 2021, she added. The President and the premier hoped that the expo would provide scope for showcasing the country's innovations, digitalization initiatives, products and services to the countrymen as well as the global community. It will surely act as a breeding front of new ideas and solutions and create business opportunities through knowledge sharing and networking.